While driving to our youngest’s bus stop I noticed a Dad who is always there with his two boys waiting in their car, wasn’t. This is how I gauge whether or not we missed the bus on its last stop. I leave earlier or later depending on all the kids morning activities. This is the happy bus stop as it is the “sleep in 15 minutes later” bus stop on Thursdays. I don’t know the folks at this stop as it is out of my neighborhood. I do know the Dad is there everyday. He gives his boys not only hugs but long hugs. He pauses and draws them even closer and whispers into their ears something that is only intended for them and then a kiss. EVERY. DAY. I marvel at the time he takes to say goodbye, while a busy highway packed with people going to work in one direction and people getting to school in the other, is paused for the flashing lights and the stop arm of the bus. I had never seen a Mom there. I assumed she worked early or late the night before or maybe there wasn’t a Mom around anymore, judging how much the Dad doted on them. These are sweet boys that would get out of their Dad’s car and talk to my boys and pet our dog. Their Mom must be the Mom that I didn’t know that I heard died of breast cancer this week. She had been fighting it for years. Probably had been fighting it all of these lovely boys memory. Once I dropped off the older boys at their school I finally had myself pulled together when our sweet electrician Earlie called. If you ever read my story about the “That Time I Almost Rendered Earlie Late” you know he is helping us out often. Earlie is a very southern gentleman, sometimes I need him to repeat himself, and he told me he wouldn’t be out to the barn-house for a few days because of his Uncle’s passing. He began to get all choked up when he said he was one of his best friends and that he and his dad were a constant in his life. So we both cried on the phone. I cried for little boys who lost their Mom and for good Dads. Earlie cried for what he told me was an Uncle who treated him like a son. We all have so much to be thankful for, even in loss. We do have each other and we have the thought and prayers of people we may not even know are praying and sending good thoughts our way. I am thankful that I have a painful reminder that life is sadly unexpected and to let my boys know that even if they lost a parent that we have set up arrangements and that they will be loved and taken care of. Some mornings we bicker about homework or quiz each other on test topics. This morning we talked about our blessings and how we don’t know what someone is going through and we should always hug long and give kisses. 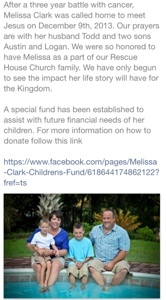 After I posted this I became aware of a Facebook page celebrating Melissa Clark and a way to donate to her young sons. What a beautiful tribute. Melissa was my 2nd cousin (her mom was my cousin). She will be missed by family and friends near and far. Thank you! Thank you for this post. Melissa was my sister-in-law and was loved very much by her family and friends. She was an amazing women. Through out her battle her faith and strength had been astounding. We never once heard her be bitter, show anger, or question “why”. Her faith in God and the eternal life he gives was astounding. She made a mark on this world, through her family, her love, and her life. The joy and faith she shared, even to the end, has helped give many peace. Most of her family is here in Oregon, and was not able to be with her for the day to day, which has been very difficult. When I read your blog, sharing the love you witnessed between the boys and dad, I am wrapped in the love my brother-in-law has been giving those boys, and the love of her community. It has given me a peace. Thank you for sharing theses observations and words, God bless you. Melissa is my dearest friend. EVER. She will remain that even though she isn’t here. The boys are Austin and Logan. 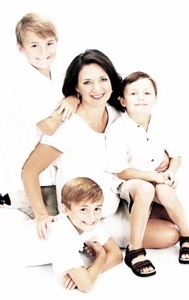 They are amazing boys – much because of they have been raised by AMAZING parents. You are right. Mom was never there. She was either fighting or fighting and working. Todd was fighting and managing a household and working. They are amazing people. Thank you for posting this beautiful reminder that you don’t know what people are going through and the extra smile, lingering hug a quick wave or hello can do AMAZING things. Thank you thank you thank you. What a beautiful picture of love you shared. 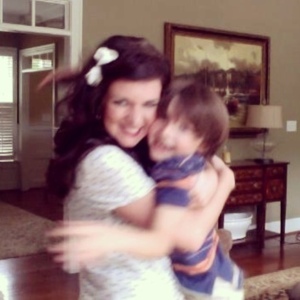 Melissa was a friend – a beautiful sweet soul – now with Jesus. Thank you for your words!